Address: 6100, Kiskunfélegyháza Dr. Holló Lajos út 9. The Kiskun Museum was founded in 1902 by Gyula Szalay, the versatile teacher of the local secondary school. In 1912 the growing collection of antiques were placed in the late-baroque Greek house, and it only moved to its present place in 1939. The painter - rewarded the Kossuth and Munkácsy prizes - was born in Kiskunfélegyháza. He lived in Debrecenben until his death. He himself donated his paintings to his town in 1961. He was a prominent artist of the Hungarian expressionism. 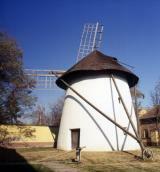 The wind mill was built in 1860. Later it was moved to the courtyard of the Kiskun Museum, where it can be seen in its original state as an exhibited object and popular monument. The carved wooden structure and the wooden floor of the mill are especially attractive. Félegyháza was established in the 14th century. It was a small village then with a small church made of stone. The Turkish burned down the habitat in 1526. In the following 200 years it was a bleak. The exhibition presents the history of the habitat repopulated in 1743 until the middle of 1920. The permanent exhibition is located in the building of the museum. The display has the characteristics of history and ethnography. The visitors may get acquainted with objects of liturgy of the Reformed Church, the Jewish community, and the Roman Catholic Church living in the area of the Kiskunság.